“Do You Want to Know a Secret” clocked in at No. 14. 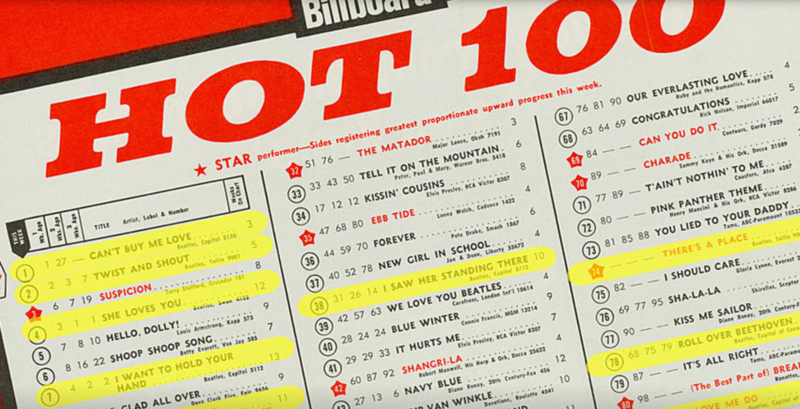 The Hot 100 also featured “I Saw Her Standing There” (No. 38), “You Can’t Do That” (No. 48), “All My Loving” (No. 50), “From Me to You” (No. 52), “Thank You Girl” (No. 61), “There’s a Place” (No. 74), “Roll Over Beethoven” (No. 78) and future chart-topper “Love Me Do” (No. 81). These chart records appeared to be unreachable, until sales of physical copies of music began to decline in the new millennium. Billboard reacted, slowly giving more attention to the internet’s role in music consumption. They pledged to take a simple approach, even before the advent of streaming. 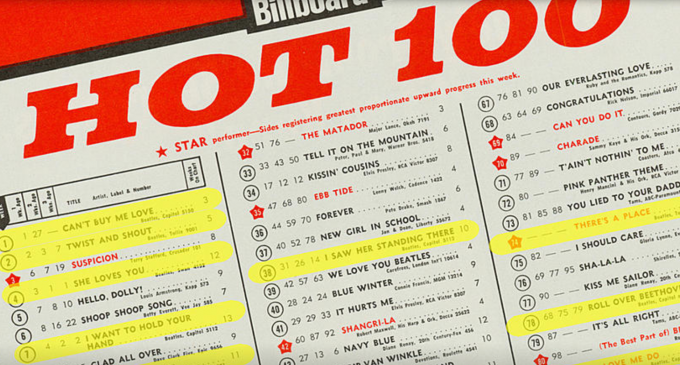 “The goal is deceptively simple: to reveal the most popular songs in the United States. Period. End of sentence,” Geoff Mayfield, the magazine’s former director of charts, said in 1998. In 2005, Billboard started factoring in digital downloads via iTunes and Rhapsody. Two years later, it began incorporating streaming data. In 2013, U.S.-based YouTube views were added to the formula. By 2017, Billboard had announced more changes in determining a song’s popularity, giving the most weight to streaming plays. Subscription streams through Tidal, Apple Music and others would now equate to one point value per play, while ad-supported plays from the likes YouTube, Spotify and Soundcloud counted for two-thirds of point. Programmed streams on Pandora and the like counted for a half point. Apple Music head Jimmy Iovine was among those who called for the change, arguing that paid plays were preferred. This wasn’t the first time adjustments had been made. The charts used to factor in jukebox plays, for instance. 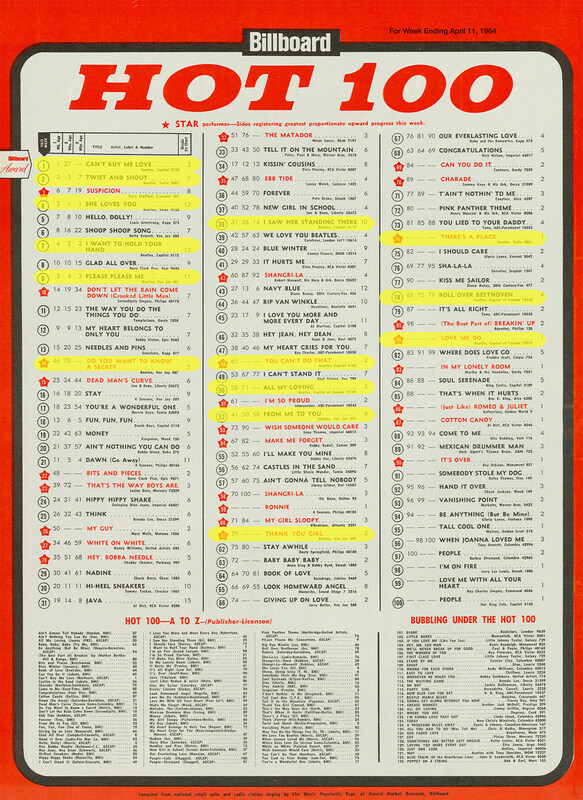 More significantly, Billboard determined in the late ’90s that singles didn’t have to be physically released to chart, relying instead on broadcast spins. The intent back then was to recognize tracks like Led Zeppelin‘s “Stairway to Heaven,” which was never issued as a 45 yet nevertheless became a classic-rock radio staple. That’s how the official recognition of streaming culture opened the door for a series of challengers to the Beatles’ acknowledged chart supremacy. Would the Fab Four have been even more dominant in 1964 had online plays of deep cuts on The Beatles’ Second Album been counted in the U.S.? That might have held off the likes of Justin Bieber and Post Malone, who have since eclipsed their chart feats. Nevertheless, Drake went on to tie the record for most Hot 100 singles in February 2015, after releasing the surprise album If You’re Reading This It’s Too Late. At that point, the Fab Four had reigned supreme for 51 years. Migos also tied the Beatles in 2018. By then Bieber had already topped that mark, posting 17 songs in the Hot 100 in November 2015 – an achievement helped along by the singer’s gambit of releasing a new video for every song on the deluxe edition of Purpose. Still, in another sign of how the industry has evolved, beerbongs & bentleys moved just 153,000 in actual album sales in its first week, according to Nielsen Music. The Beatles’ chart-topping sophomore release had already reached $1 million in sales just four days after its April 10, 1964, release, eventually going double platinum. The opening song on the Beatles’ debut album and the B-side of their first U.S. Capitol single. Any wonder why it holds such a special place in fans’ hearts? An early Beatles original that was never released as a single but became one of their most popular songs just as Beatlemania was taking hold. The title track to the group’s first movie begins with a chiming chord that rings like a bell signaling a new era. And in a sense it was: the first Beatles album to include all original material by Lennon and McCartney. McCartney wasn’t even 23 when he recorded “Yesterday,” one of the most covered songs in music history. He reflects like a man twice his age on what is basically a solo track (producer George Martin brought in some strings). One of the Beatles’ first steps toward maturity … and a timeless classic. Beatlemania was draining the group by the end of 1964, when their fourth album in a year came out. You can hear the strain throughout Beatles for Sale, but “Eight Days a Week” still shimmers. McCartney had “Yesterday”; Lennon had “In My Life.” He had just turned 25 when he recorded this plaintive song about looking back. The Beatles had grown up immensely since “She Loves You” and “I Want to Hold Your Hand.” “In My Life” was just the start. Recorded at the start of the Revolver sessions, “Tomorrow Never Knows” is the sound of the Beatles reinventing themselves and modern music in the process. Tape loops, backward guitars and an abstract wall of noise serve as the bedrocks of a truly revolutionary work. Nothing was the same after this. The Beatles’ vision, ambition and execution flawlessly come together in five and a half breathtaking minutes. It’s the culmination of the landmark Sgt. Pepper’s LP and of the band’s career, stitched together from two separate songs. Pop art doesn’t get more sublime than this. A bit of lyrical surrealism by Lennon that perfectly suits the Beatles’ post-Sgt. Pepper’s creative rush. Loaded with sound effects and distorted side trips, “I Am the Walrus” is a grand aural experiment. Harrison’s tour de force is a sly dig at the other Beatles during one of their most tumultuous periods. The White Album is basically four solo albums with assist from the other members and occasionally outside guests – like Eric Clapton, who contributes a searing guitar solo here. Recorded before the White Album but not released until the Yellow Submarine soundtrack a year later, “Hey Bulldog” belies the difficult times ahead with its playful tone, which includes Lennon and McCartney barking like dogs. Harrison was finally given an A-side of a Beatles single, pulled from the final album they recorded. It went to No. 1. A majestic love song better than anything on the LP written by his two more established bandmates. McCartney’s tribute to his late mother doubles as a meditative hymn to the final days of the Beatles. They knew the end was near. “Let It Be” is their somber farewell.